Elements of "Graft" arrive from Treadwell, New York, on three flatbed trucks in the early morning hours of October 26. Roxy Paine's crew prepares "Graft" to be hoisted by a crane and lowered onto its cement pad. Roxy Paine directs the positioning of his sculpture in the Sculpture Garden. Ben Jones (center), studio manager, helps to fit the two largest elements of "Graft," while artist Roxy Paine (left), prepares to weld the segments together. 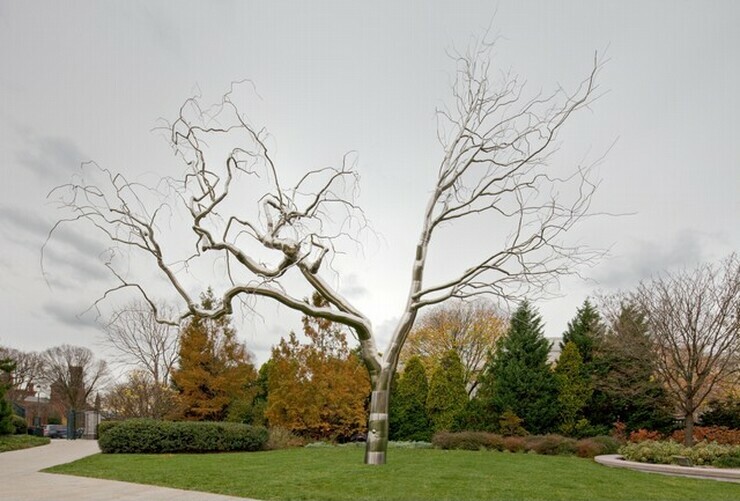 Roxy Paine (left) fits together two large components of his sculpture "Graft." The artist welds together components of "Graft" in the Sculpture Garden. Paine dries off an element of "Graft" before it is hoisted by crane to be welded onto the main trunk. A component of "Graft" is hoisted by crane to be welded onto the base of the sculpture. Paine overseeing the installation of "Graft." The artist's crew at work assembling Roxy Paine's "Graft." Roxy Paine (right) and one of his crew members position elements of "Graft." Paine's maquette, in the foreground, was used by the artist as a guide for the sculpture's installation. Roxy Paine's crew at work installing "Graft" in the Sculpture Garden.